The article above was submitted to us by an Inhabiots reader. Want to see your story on Inhabitots? Send us a tip by following this link. Remember to follow our instructions carefully to boost your chances of being chosen for publishing! Designed to "fill in the gaps," Tree Line Studio scarves, armwarmers, and legwarmers help you through transitional weather, when those chilly mornings turn into hot afternoons. 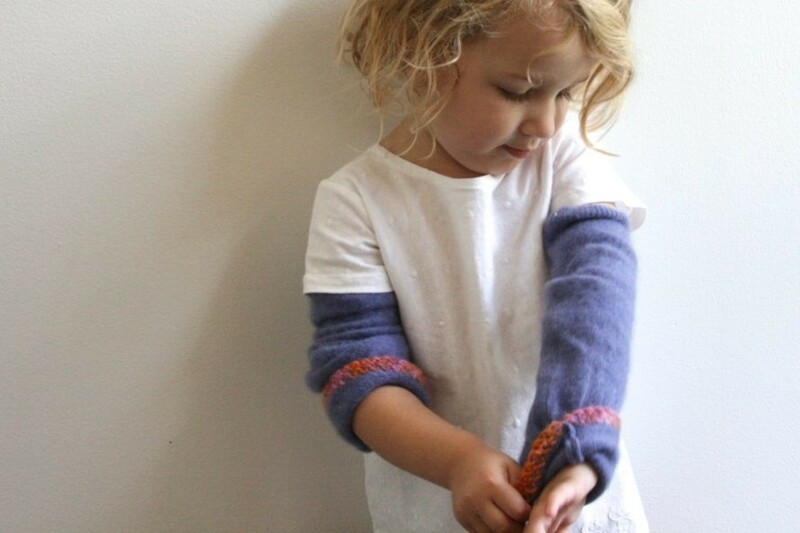 They fill in the gaps between your child's too-short pant legs and sleeves, and help you make that gorgeous fall coat last just a bit longer into winter. All items are handmade, combining high-quality recycled wool and cashmere with simple hand-knit trim and cuffs. As the owner/artist of Tree Line Studio apparel, "I love thinking about the previous lives of the recycled sweaters I work with. After I work my magic on them, they are refreshed and ready for their next adventure."